I had a slightly funny series of events involving my nonexistent spatial sense and cocktails. I was going to go get a thingy at Williams Sonoma to make enormous ice cubes, only I got there and the one they had made 2″ by 2″ ice cubes. “This can’t be right,” I said to myself, picturing a cocktail at some imaginary, amalgamated unmarked bar. 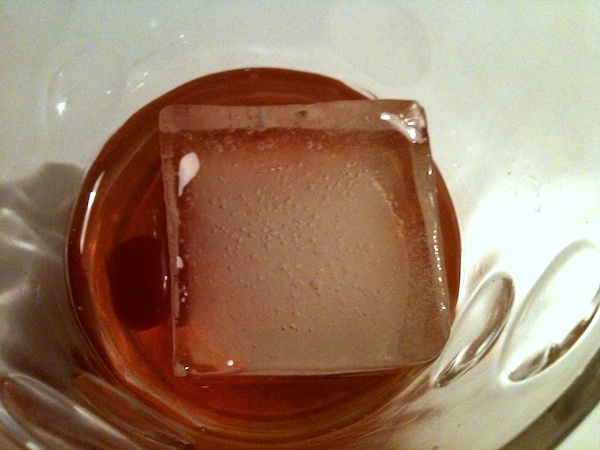 “I think the ice cubes they use are at least 4″x4″.” Which of course they aren’t. So then we’re at some unmarked bar this weekend having that kind of cocktails and I look at the ice cube and say to our mutual friend, “how big would you say that thing is?” to which of course he says it’s about 2″. And then we laughed at my imaginary HUGE ICE CUBES OF HUGENESS. So I’m going back to Williams Sonoma. You could make it even drier by just using cherry bitters, I imagine. I am enjoying this beverage right now, with fancy cherries and Castillian bitters for orange. Otherwise: big ice cube, check, Old Overholt, check. The one think I would note is that the viscosity of the Luxardo cherry juice required me to lick the measuring spoon afterwards, a terrible trial. Yay! I should get some of the fancy cherries, because they really are better for Old Fashioneds. I’m also not entirely sure it was a half teaspoon — maybe a little less. I wanted the sweetness but not a full sugar-cube’s worth. I had another long day and am trying to resist the temptation to mix myself one of these. Smearcase, you perhaps were thinking in the type of inches used to measure the male anatomy? Shake with ice, strain into champagne coupe. Drink intently. That sounds excellent. As anyone who follows me on the various social media might deduce, I gave in to temptation. Geez, how many different types of bitters and cherries are there? I thought I was “in the know” about drinks, having tended my fair share of bar in past years. I capital H Hated making old fashioneds, especially when the philistines ordered them neat, during busy times because I was too OCD to not do a proper muddling, but who has time for that in a busy bar on any nights but Monday and Tuesday, I ask you? So glad to know that some people learn to make their own damn complicated drinks!